Because he had been forced to intervene in the careful plan to get information from the Hit Rabit, it was incumbent upon the Wabbit to buy lunch. So he chose a rather swishy venue that he thought might impress. And he was absolutely right. Sensing his advantage, he decided to kick off the discussion. "What was that for a sort of adventure?" he asked. "I thought it was turning into a mini-series," laughed Lapinette. "A mini series, that's just the job," said Wabsworth. "My data banks indicate that a mini-series is overdue." "Not soapy enough," smiled the Wabbit. "No melodrama!" "I thought it was a buddy movie," said Lapinette, "in which the female was relegated to the background." "What will you have to eat?" 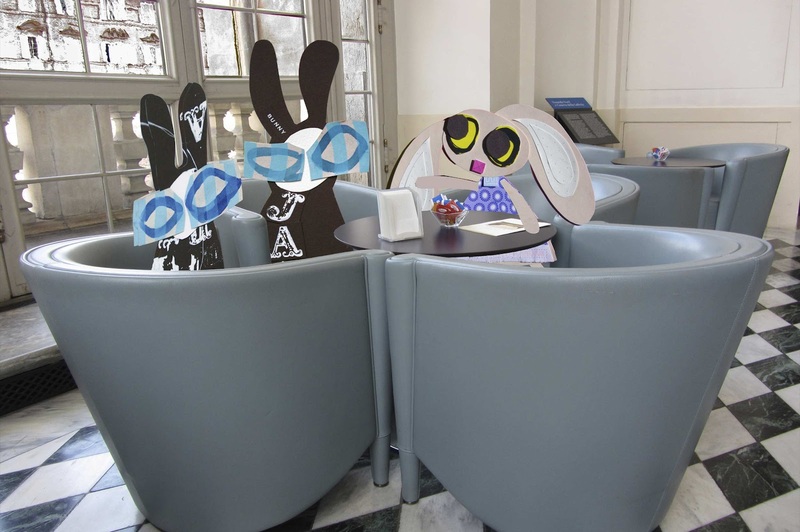 asked the Wabbit, quickly handing Lapinette the menu without prices. "Artichoke roulade," said Lapinette with a smirk. The Wabbit mentally kissed goodbye to a week's wages but felt it worthwhile. "We've been getting letters from the Sombrero Galaxy," said Lapinette. "Oh really?" said the Wabbit. "It's just a scam. Pay no attention." "I expect they're fed up with new people that don't pay their fares," said Wabsworth. "They need to be more tolerant of outsiders," smirked the Wabbit. "Perhaps we can interest them in bio-diversity." "Bio-diversity is old hat," said Wabsworth. "The notion of the umbrella species has quite put paid to all that tosh." "An umbrella species like us rabbits!" laughed Lapinette. "I prefer flagship species," said the Wabbit.